This page is your place for John Deere Tractors & Equipment. John Deere has made so many models of their tractor lines over the years that it is sometimes a monumental task to try and remember them all. The photo at the left is a late styled Model AWH. and we'll see it gets attention.......Just make sure to include the words "John Deere" in the subject line! John Deere Inc Website: - This is the main John Deere Company web site where you can find anything made by the Deere Company! 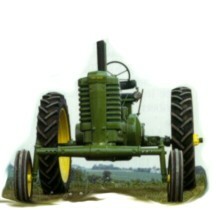 Gene's Antique John Deere Tractors: - Tons of antique John Deere tractor suff on this web site. Check it out! Green Magazine - The premier magazine for John Deere Enthusiasts. Mike's Antique Tractor Page: - Follow along on Mike's restoration process of his JD 320. Good page for JD 320 technical information and data as well. GreenCollectors.com - An Independent Web site for John Deere Collectors, a very intense collection of JD stuff. Terry and Carolyn's Tractor Pages: - This is Terry and Carolyn's John Deere B tractor story page. Troy & Kathie's JD Collection Web site: - Take a look at their extensive collection of green. Pretty cool! Two-Cylinder Magazine On-line: - The magazine for John Deere Two Cylinder Enthusiasts. K & K Antique Tractors - Lots of Antique John Deere tractor stuff. Parts, decals, restoration tips, etc. Brian Lowery's - The Deere Farm: - John Deere antique tractor and stationary engine restorer and collector. Todd's Tractor Pages - Featuring the John Deere 40: One of the the premier web sites for information on John Deere Model 40 tractors. Good info on this series. Johnnypopper 720's Home Page: - A real boat load of information on John Deere tractors. Photos, data, links and more! The Ridenour's John Deere L, LA & LI Tractor Homepage - About everything you want to know about the L Series John Deere Tractors. The Suiter Webpage - John Deere Parts: - Parts, serial numbers, carburetor ID's, links, etc. Sharp's Antique Tractor Works - Another massive John Deere H specialist and other JD models. Spiegelberg John Deere Tractor Restoration and Service: - Company specializes in John Deere restoration and service but restores and services all other makes. Jorde's John Deere Decals: - High quality decals for antique John Deere tractors. Indy Tractor LLC - John Deere Toys, Shirts, Gifts and More. Run Green.Com: - Company sells everything John Deer. Clothing, parts, toys, accessories, etc. Frank's Place - John Deere Restoration photos and links. Vintage Tractors.Com - Deals in vintage tractors and used parts (mostly John Deere). Bogan Restoration Services: - Specializing in John Deere Bicycles. Restores, buys, sells, and trades vintage bicycles, pedal cars, toys, and metalware. ATRP's JOHN DEERE Tractor Values: - 'Nuff said. Lots of good info. Weird Deere: - A Web Site Featuring Industrial John Deere Tractors. JohnnyPutt.Com - A whole bunch of "GreenStuff" on this site. Don Antique Tractors: - Don Peck has tons of John Deere parts (and others) for sale on this website. JD Crawlers: A great web site built around the specialty of John Deere Crawler Tractors. Lots of neat stuff here for you JD fans. Check it out! Forty-Twenty.com: A very nicely put together web site with the Model 4020 JD as a feature. Theoldtractorcompany.com - Greg Stephen's web site for John Deere tractors. An old pro with antique JD's and JD stuff! Davenport Tractor: - "Always On The Hunt" - Rare and hard to find parts. (Formerly known as "Deerely Departed"). The Leaping Green Tractor Collection - Where everything old is new again! The John Deere Model 40 Website - Got a 40? Wanna know about it? Check out this site! Philip's Tractor Page - Some cool JD stuff on Phil's site. Dale's Deeres Website - Lot's of John Deere Tractor stuff on this web site. Check it out! Old Antique Tractors.Com - Tremendous parts resource for old John Deere Tractor restorers. The Cascade Two Cylinder Club: - Washington state. 53rd Annual Steam, Gas & Threshing Show. The John Deere Company - History from Wikipedia, the free encyclopedia.